A UK soldier who became Britain's first convicted war criminal has been jailed for a year and dismissed from the army. Cpl Donald Payne, 36, had pleaded guilty to inhumanely treating civilian detainees in Basra in 2003. 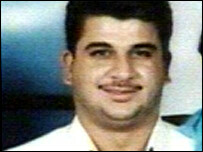 Six other soldiers were cleared of the alleged abuse of the detainees, who included Baha Mousa, who later died. It was the first time British servicemen had been prosecuted for war crimes under the International Criminal Court Act 2001. Cpl Payne's admission resulted in him being Britain's first convicted war criminal. He was cleared by a court martial of manslaughter and perverting the course of justice. His sentence, announced at a military court in Bulford in Wiltshire, will also result in the loss of approximately £300,000 in future earnings and pension. General Sir Richard Dannatt, the Army chief of staff, said the case contained the "uncomfortable fact" that Mr Mousa, 26, died in British custody. He said: "In no way do I condone what happened. He and other Iraqis, that we took into our custody, should have been treated properly and lawfully, and they were not. "That said, we ask a great deal from our servicemen and women, in very demanding operational circumstances, and bar a very few exceptions, they live up fully to our values and standards." During his court martial, the prosecution heard that Cpl Payne had "enjoyed" hearing Iraqis call out in pain as they were kicked and punched while in a detention centre and that he referred to the noises made as "the choir". Despite this, hotel owner Ahmad Taha Musa Al-Matairi - one of the men allegedly abused - urged the court martial to have mercy on Cpl Payne. Along with six other men, Cpl Payne was accused of charges relating to the abuse of the group of Iraqi men arrested at a hotel where weapons and suspected bomb-making equipment were found in 2003. The prosecution said that while undergoing so-called conditioning for interrogation, the group were forced to stand in a painful posture. If they failed to maintain the position - with arms outstretched and knees bent - they were beaten, the court was told. Baha Mousa was found to have had 93 separate injuries to his body. Cpl Payne's commanding officer Col Jorge Mendonca MBE was among the six other soldiers cleared. The 43-year-old former commander of the QLR - and the highest-ranking British serviceman in recent history to face a court martial - had been accused of negligently performing a duty.